The Speaker of the Northern Ireland Assembly, William Hay MLA today launched an art exhibition to mark the beginning of Mental Health Week. The exhibition promotes mental health through art and art therapy and has been developed in association with Action Mental Health and Seacourt Print Workshop. 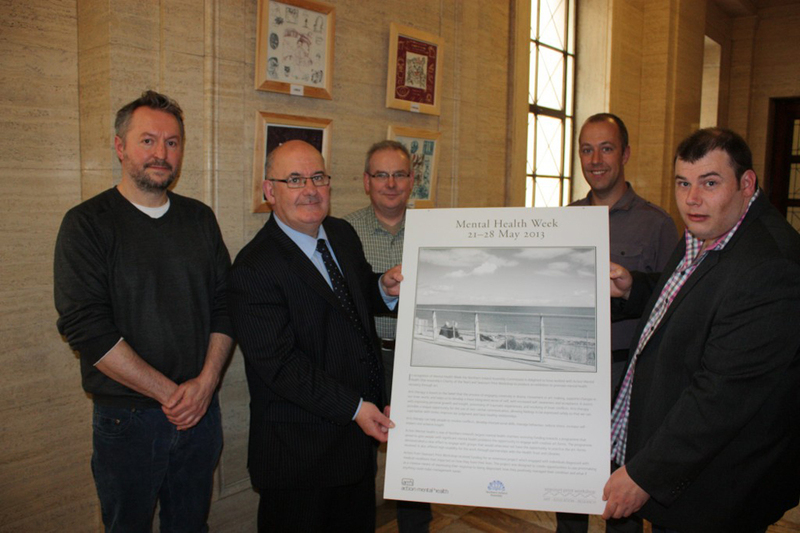 Speaker William Hay said: “It is very fitting that the Assembly has today launched an art exhibition for Mental Health Week. Promoting good mental health is something that we take very seriously; in fact, Action Mental Health is the Assembly Commission’s charity of the year. “Using art as therapy is a recognised way of improving personal growth and insight. It also helps people to process traumatic experiences, resolve personal conflicts and increase self-esteem. Action Mental Health is one of Northern Ireland’s largest mental health charities receiving funding towards this programme which is aims to give people with significant mental health problems the opportunity to engage with creative art forms. The artists from Seacourt Print Workshop worked with individuals diagnosed with medical conditions that impacted on how they lived their lives. The project was designed to create opportunities to use printmaking as a creative means of expressing their response to being diagnosed, how they managed their condition and ways of improving their lives.